The idea of weight loss is way too common among the women of the 21st century who have been displaying their unabashed intolerance for even an inch of excess. However, what seem to be more common are the mistakes that the ladies make when it comes to converting their thoughts on shedding the extra pounds to action. Here are some of the mistakes that are widely embraced today, but should be discarded as soon as possible. Instant solutions – Firstly, giving in to instant solutions like weight loss pills and potions etc should be given a serious thought. These solutions contain more ingredients for overall health issues than dropping the excess poundage. You may have to spend more time and money fixing the health damages after long term exposure to these questionable products. 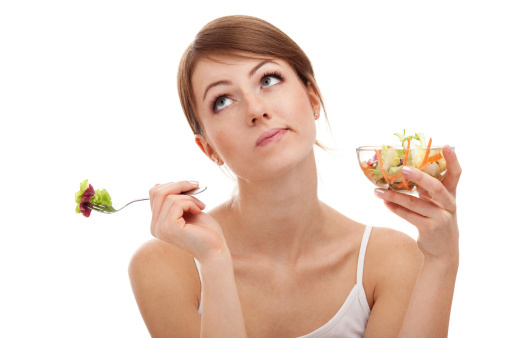 Eating less – This issue has been hounding girls as young as 13 / 14 years of age. This is a massive health issue and has been taken up very seriously in academic institutions for the wide spread negative impact it has had on thousands of girls suffering debilitating muscle wastage and organ failures by the age of 16! Skipping meals – You can fool you mind but not the body. Skipping meals does nothing more than making you eat in greater quantities in subsequent meals and that too, unapologetically. This way, you put on more weight than lose it. Saying no to carbohydrates – Annoying as this sounds to sound nutritionists, most women feel that carbs are their enemy. While it is true that it is necessary to keep carbs under control, eliminating it from your diet completely will leave you with very little or no energy to function throughout the day. This will eventually make you a bag of aged bones even before you hit your 40s. Ignoring proteins – This is a criminal offense against your body. Many women who switch to strictly green diet should know that body needs to process proteins with the help of carbs to build muscles. If you deny these two essential nutrients, you may become thin but in a sickly form than a lean athletic shape. Going on a liquid diet – Liquid diet lacks in fiber. No fiber means no regulation of blood sugar which goes on to mean that your sugar level will constantly be up adding more to your set of issues than help you lose weight. Barfing up the excess – What goes in should stay in, unless of course, it is poison. If you think you have eaten a portion too large, barfing it up will bring out the entire content than just the excess, along with the entire nutrient content. You can see yourself in the ER in less than a month! No work out only diet – There is no bigger truth than the fact that diet management has to go hand in hand with exercising for achieving weight loss in a healthy way. Only managing diet may make you thin, but it is working out that will gift you the silhouette! Working out and eating everything – Overestimating working out and the calories lost through it can propel ladies to justify eating larger portions. This is perhaps the most common mistake made by the latter which taken them one step ahead and two steps back in their efforts. Stagnated routine – When exposed to the same routine over and over the months, your body tends to get used to and eventually stops responding to the routine. You need to change your schedule and create more challenges for your body for quicker weight loss.